R.B.I. Baseball 3 took the popular baseball series a step further statistically, adding each Major League Baseball division winning team from 1983-1990, in addition to the 1989 All Star teams and all 26 1990 teams (with full 1989 statistics). Want to see how the 1986 Mets might have done against the 1987 Twins? Here's your chance. 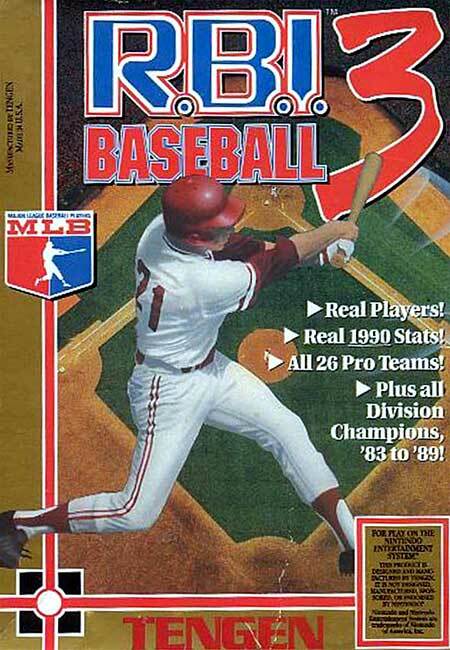 The game was licensed by the Major League Baseball Players' Association; thus, real Major League players and statistics are included, but the teams themselves are represented only by their home cities. Team names are not used. Also, retired players who were no longer under contract with the MLBPA in 1991 are not present. Rather, they are represented by their initials and their fielding positions. Game mechanics remain unchanged from R.B.I. Baseball 2, focusing more on arcade fun than realistic gameplay.